This rendering shows a concept for the Aerial Rapid Transit (ART) project, which would ferry riders to and from Dodger Stadium. Dodger fans heading to Chavez Ravine have long dealt with the traffic nightmare that accompanies each home game. But a new plan being pitched could help Angelenos rise above the congestion. 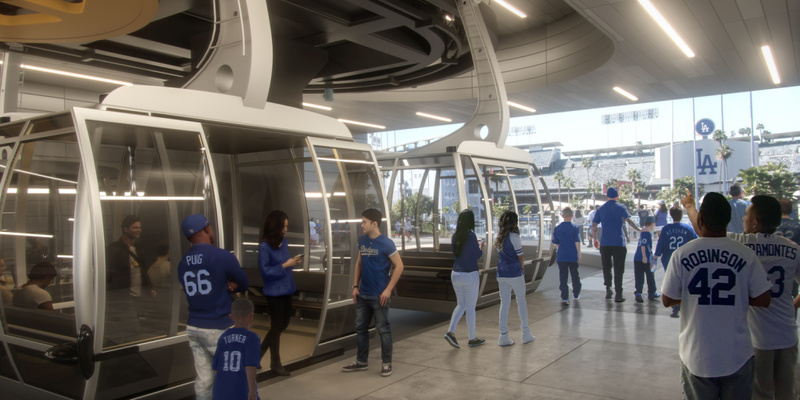 On Thursday morning, Los Angeles Mayor Eric Garcetti gave a presentation at the weekly Metro board meeting, proposing a gondola lift from Union Station to Dodger Stadium. 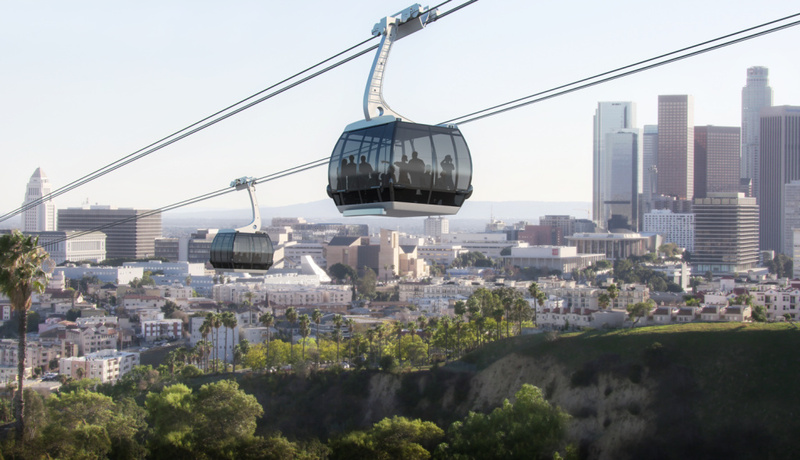 The Aerial Rapid Transit (ART) project, proposed by Aerial Rapid Transit Technologies LLC, would "transport Dodger fans, community members, and visitors from Downtown Los Angeles to the Dodger Stadium property in minutes," the company said in a release. The company said the project will be a privately funded, "zero-emission transit line." The L.A. Times reported Thursday that a familiar face is funding the company behind the project: former Dodgers owner Frank McCourt. The company is seeking cooperation from Metro to help plot out a route for the gondola line and start a public environmental review. If all goes according to plan, the gondola lift could be open in 2022. So how feasible is something like this? The proposal promises to get riders from Union to Dodgers stadium in about five minutes. "If I take the sketch figures seriously," said USC Engineering professor Jim Moore, "it's about 5,000 persons per direction, per hour. That's about two and a half traffic lanes per direction, per hour. So that's basically good news." The added bonus is this isn't brand new technology, it's been implemented a number of different places. "It's certainly worth examining," said Moore, "and I won't dismiss it." We've built gondola systems in some very challenging areas. They show up in mountainous areas where there are big changes in elevation, smaller version service ski lifts. So, you can build a system like this just about any place you really need it. It's a lower imprint activity than some other transportation options. So it might well be possible to exercise this option where others would be more challenging. And it's not an original idea. 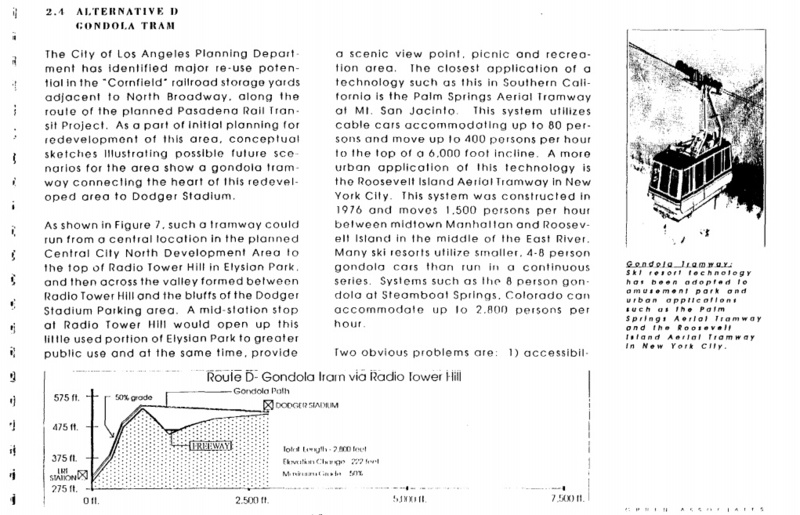 Back in 1990, the Los Angeles County Transportation Commission released the Dodger Stadium Transit Access Study, which explored ideas like pedestrian escalators, a shuttle bus service — and a gondola. L.A. County Transportation Commission Gondola Plan from 1990. When the big one hits, are you ready? As LA's homeless crisis persists, should 'hostile urbanism' be reexamined?